Gently used CURRENT BECKETT BASKETBALL PRICE GUIDE MAGAZINE MAY 2019 STEPHEN CURRY Durant. Condition is Brand New. Shipped with USPS First Class Package. 1991 Score baseball Red Sox team set. Any cards that feature multiple players from different teams will go to the first team sold. Sports Illustrated February 11, 2019 Tom Brady New England Patriots Super Bowl . Condition is Like New. Shipped with USPS First Class Package. 1988 Score baseball Brewers team set. Any cards with multiple players from multiple teams will go to the first team sold. December, 1995 issue with Greg Maddux on front cover and Garret Anderson on back. Beckett FOOTBALL Card Monthly's NM/MT 1990-2001. Available Issues, Players listed are on Cover and/or Back 1995 April-Young&Rhett, Aug-KiJana&Watters, Oct-B Sanders. 1986 Fleer Classic Miniatures team set. White Sox team set has 5 cards. Excellent condition. upper right corner has slight bend. binding edge is worn off due to storage (not use). actual binding is not creased at all. This is the premiere issue featuring Ronda Rousey on the cover. 1991 Beckett Future Stars #2 issue with Frank Thomas Cover and Shaquille O'Neal on back.,like new condition. Braden Holtby Cover Beckett NHL Price Guide. March, 2016 Issue # 283. Beckett Hockey Monthly Price Guide of Brett Hull #2 Nov/Dec 1990. Used but in excellent condition. MAGAZINE, IN MY OPINION, IS IN EXCELLENT/LIKE NEW CONDITION. 1985 Tom Seaver's Baseball Card Book Paperbacks by Seaver & Siegel CHEAP!!! Tom Seaver's Baseball Card Book Paperback Books By Tom Seaver with Alice Siegel & Margo McLoone-Basta Published 1985 by Simon & Schuster A Fine Addition To Any Baseball Book Collection! Nice Beckett from March 2006 featuring Iverson. See photos for exact item. 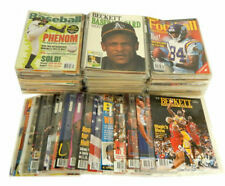 Beckett Baseball Card Monthly's NM/MT 1990-2002. Available Issues, Players listed are on Cover and/or Back. You will receive Beckett Baseball Card Monthly Issue #61 April 1990 (Mark Grace on cover). Beckett Baseball Card Monthly Issue #67 October 1990 (Jose Canseco on cover). Beckett Baseball Card Monthly Issue #78 September 1991 (Dave Justice on cover). Brand new. Dan Marino tribute issue. This is the first issue of the Beckett price guide for Hockey and of course who else would be on the cover except the "Great One". Dylan Larkin Cover Beckett NHL Price Guide. May, 2016 Issue # 285. 1988-89 Score Baseball's 100 Hottest Rookies Book. Hard to find collectible with Rookie scouting reports of the year's hottest rookies to hit MLB. Cards not included. Buy more and SAVE! BASEBALL CARD PRICES - CLASSIC.